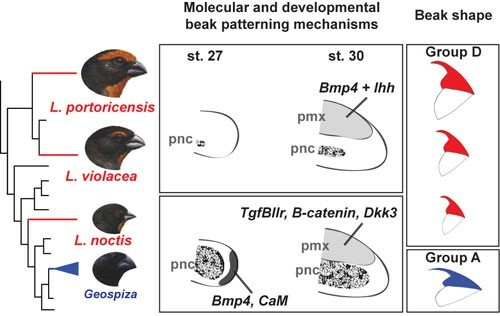 Together with co-authors at Harvard University, we recently published a paper in Proceedings of the National Academy of Sciences that described the evolution of beak developmental pathways in Darwin’s Fiches and their relatives. The paper includes three components: 1) a mathematical analyses of beak shape among the all species in the Tholospiza clade, 2) studies of beak development of Caribbean bullfinches in the genus Loxigilla, and 3) a new phylogeny of Darwin’s Finch relatives based on multiple genes. One of our more interesting findings is that species of Caribbean bullfinches have convergently evolved the exact same beak shape. Unexpectedly, this shape is controlled by different developmental pathways. All three species of Loxigilla (in red) have the same beak shape. However L. noctis is more closely related to Darwin’s finches (Geospiza) than it is to other Loxigilla. Thus, this beak shape has evolved at least twice. In agreement with phylogeny, Loxigilla noctis shares the same beak developmental pathway as Geospiza.